June 2010 was the turning point. It was the making of Enda Kenny. 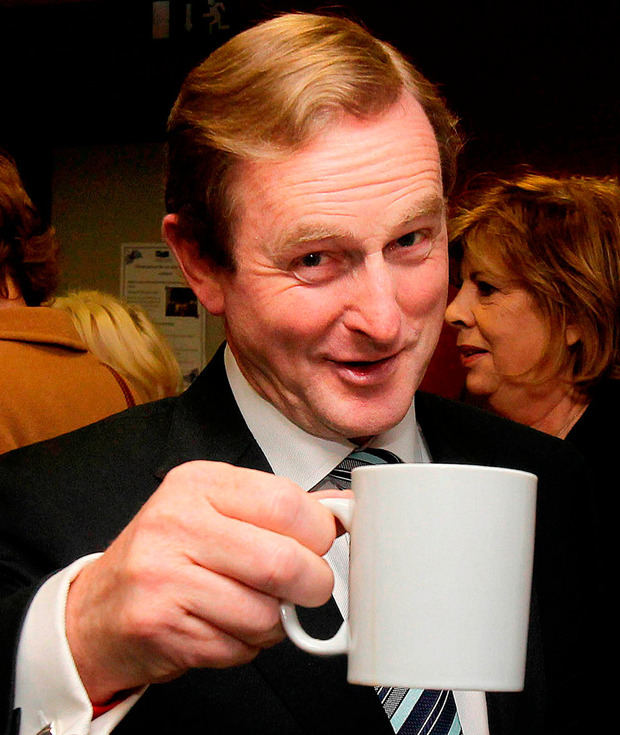 Kenny turned up at a meeting of the Fine Gael parliamentary party with his career on the line. All the work he had done rebuilding the party could come to naught. Most of his front bench had come out against him after yet another poll showed that Fine Gael was failing to capitalise on the country's economic collapse. Leo Varadkar delivered a scathing line on RTE's Prime Time: "If we're in government and there's a national crisis, a sovereign debt crisis, and if Patrick Honohan lifts up the phone at 3am and rings the Taoiseach, who do I want to answer that phone?" The clear implication was Kenny wasn't up to the job. While Richard Bruton and the fellow challengers were on the airwaves talking to the public, Kenny and his team were busy canvassing the parliamentary party - the people who actually mattered. He did deals with some, probably offering finance to Michael Noonan. Kenny blindsided the challengers to his leadership by tabling a confidence motion in himself, depriving the other side of time. But he still needed to convince the undecideds in the room. He delivered an impassioned speech that pointed out Fine Gael was risking its chance of power by starting another internal battle when the work had to be done in the country. He made enough of them reconsider. He was given another chance. Even though Kenny had been leader of Fine Gael for eight years and a TD for 35 years, large sections of the party were unconvinced. His performance in June 2010 showed a side to Kenny of which many in the public were unaware. He was a battler. Right from retaining his father's seat in Mayo in the 1975 by-election nothing ever came easy to Enda Kenny. He had to fight for it. And he became good at it. The gauche young fella who entered Leinster House aged 24 looked shy, a bit unsure of himself, and didn't fit comfortably into a Fine Gael debating between social democracy and Christian democracy. He liked to talk football over a few pints with the lads. Through his career, he contrasted with Brian Cowen, the man he was to replace as Taoiseach. Cowen quickly marked himself out as a star, rising through the ranks of Fianna Fail with ease. Kenny had a few mis-starts. As a young TD in the 1980s, he failed to get promoted at a time when the Taoiseach and Fine Gael leader, Garret FitzGerald, fetishised youthful promotions. Kenny doesn't rate a mention in either of FitzGerald's two autobiographies - but FitzGerald made no secret of his admiration for Cowen, noting that "he was clearly the ablest of his generation". Ivan Yates reflected the view of many that Kenny "was easy-going, likeable and inoffensive". Faint praise. There was a consensus that, while bright, Kenny was not that hard-working, and his main asset was that he was very personable. Kenny finally made Cabinet in 1994, when his patron, John Bruton, became Taoiseach, but then in a peripheral role. He never really showed any interest in policy. He did enough to retain his seat in Mayo, but in 2002 came uncomfortably close to losing it. It was the 2002 election, which cleared out so many from the Fine Gael parliamentary party, that gave Kenny the leadership. Most serious contenders were gone. He won the contest, marked for its absence of an ideological debate. Fine Gael was dying a slow death. Kenny immediately set about reorganising the party and did the hard yards, travelling the country to attend local branch meetings, spot potential candidates, and get the party's finances back in shape. But there was no obvious ideological direction, and when he spoke, it always looked as if he was just repeating lines he'd learned off. It was worse when he didn't repeat those lines; then he was capable of speaking nonsense. Coming up to the 2007 election, the questions over Kenny's ability remained. He simply did not look like a Taoiseach-in-waiting, and even though Bertie was only a half-interested participant in that election, he still managed to beat Kenny. Kenny, in his own words, never took himself too seriously, and neither did the public. But Kenny had identified a few themes: trust, honesty and delivery. He fought the election on those. Fine Gael won 20 extra seats - no small achievement. If it wasn't for Cowen's interventions to recast it as an election on economic competence, Fine Gael could have been in a position to put together a government. Kenny was disappointed not to become Taoiseach in 2007, and his desperation was shown in his willingness to consider a coalition with Sinn Fein. That disappointment presumably turned to relief as the economic crisis unfolded. But Kenny failed to offer the public a strong alternative to the Cowen government. He criticised the government's handling of the economy without really saying what he would do differently. Fine Gael supported the Bank Guarantee Scheme and the nationalisation of a number of banks. By 2010, with the Cowen government falling apart and poised to enter the Troika-lending programme, the leader of the Labour Party Eamon Gilmore was clearly thought of as the best alternative Taoiseach. Kenny's front bench turned on him. He emerged strengthened from the strategically inept coup against him. The 2011 election was an open goal for the party, but Kenny ran an efficient campaign that highlighted the broad base of talent in the party. He displayed no bitterness in reappointing many of those who had plotted against him. He was smart enough to know that a campaign centred on Enda Kenny might fail. Michael Noonan was used to reassure the public in ways Kenny couldn't. Not many politicians have the self-awareness or lack of ego to do that. When he put together the coalition with Labour, Kenny's lack of ideology became an advantage. In government he never got bogged down in theoretical debates, looking simply to what could work; whether it would work politically and economically. He became a good Taoiseach. His ministers welcomed the pragmatic approach that looked for solutions within the confines of the Troika programme. He changed the tone in the country. Cowen depressed an already defeated Ireland. But Kenny, with his high fives and endless optimism, cheered the place up, despite ourselves. Some in the country wanted a more radical approach, for Ireland to stand up to the EU, but Kenny was characteristically cautious and pragmatic. He delivered the Troika programme without too much fuss, and internationally he was recognised as being a strong leader, picking up baubles and Time magazine covers on the way. All the indicators pointed the right way. Debt fell, unemployment fell, emigration fell and Ireland became the fastest-growing country in the eurozone. He should have found it easy to get re-elected. However, Kenny's failings had become apparent when the Troika left. What should have been a triumph became a slow decent into incoherence. Kenny had no idea what to do with the improved economic situation that he had helped deliver. There was no vision, no willingness to tackle the social scars left by economic crisis and no understanding that people were still angry. The Fine Gael campaign in 2016 was more Kenny-centric and it didn't work. The party's support was closer to where it was in 2002 than it was in 2011. Ever the battler, Kenny took an unpromising election result and became the first Fine Gael Taoiseach to be returned. He managed to squeeze another year out of this Government, but it is a Government marked by its inability to govern. Kenny's willingness to compromise could keep him in office, but his power had waned. Again we saw the two Enda Kennys. He worked hard on Brexit and positioned the EU to take Ireland's concerns seriously. When he was well prepared, he was excellent. But then he was incoherent and incredible in his handling of the Garda whistleblower cases. It was the proximate cause of his departure. The party finally lost patience. Kenny still couldn't think or speak on his feet. He could be very good. He just wasn't very convincing.